The market for hot drinks in Western Europe is currently valued at 27.1 billion euros, while the Eastern European market lags behind with less than half the value at 11.3 billion euros. The market is predominantly made up of coffee, with tea and other hot beverage products, such as hot chocolate and malt drinks, taking a smaller share. Coffee has experienced year-on-year increases in revenue as consumers become more interested in premium products, either in the sense of higher quality roasts and beans, as well as via easier access to better coffee machines in the home. As always, convenience is key, particularly in the case of the coffee capsule market in the European Union: the days of pushing plungers and waiting for coffee to brew are long gone. There are a number of available coffee products, from instant coffee to roasted or decaffeinated, of which levels of consumption differ greatly between countries. The Spanish prefer natural coffee, for example, whereas the British are the only consumers in Europe to favor instant soluble coffee over proper variants. 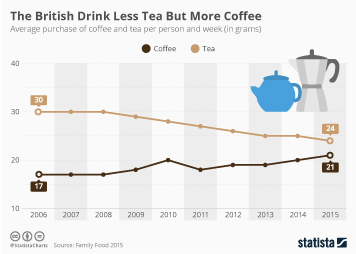 Similarly, the market for tea has also experienced increases in value as current health and wellness trends in the European Union highlight the medicinal benefits of different tea types. As more and more consumers turn their backs on artificial and processed food and drink products, natural and plant-based alternatives have become the norm, with herbal and fruit teas the most favored in particular. The rise of alternative tea types to standard black tea can be seen in changing levels of consumption, with loose leaf variants also increasing in popularity. Other hot beverages available consist of hot chocolate and malt beverages. Although less popular than coffee and tea, they also serve a different purpose with consumers drinking such beverages in the evening, in contrast with coffee and tea more commonly being used earlier in the day, especially mornings. Irrespective, other hot beverages have not experienced the same levels of revenue growth as coffee and tea.